18 May Filed under Critical Speculation, Physical Intervention. 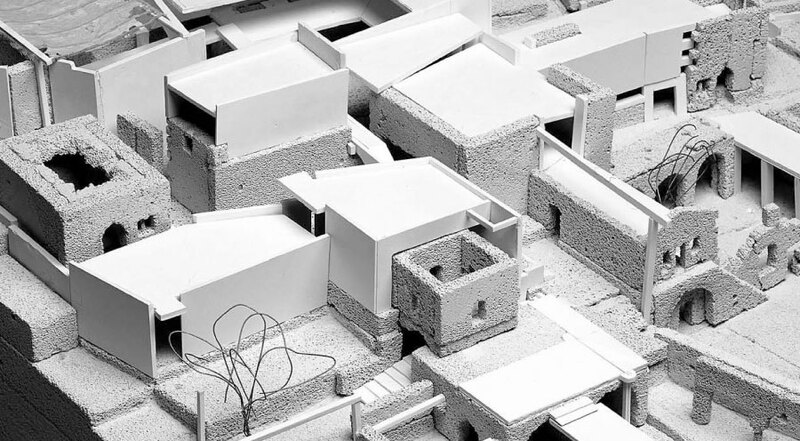 Tagged 1948, architecture, competition, israel, palestine, refugee camp, refugees, resistance, return, spatial struggle. Bookmark the permalink. Post a comment. Leave a Trackback (URL). In this moment of seemingly unlimited possibility, where Al-Awda (‘The Return’) suddenly moves from a nostalgic imaginary to something both tangible and realisable, we are forced to engage in new ways with the spatial, political and social landscapes of Israel-Palestine. Instead of asking “can we return?” or “when will we return?”, Palestinians are suddenly allowed to ask “what kind of return do we want to create for ourselves?”. What seems evident is that Al-Awda will not be a return to the rural villages of pre-1948 Palestine as so many nostalgic narratives depict. 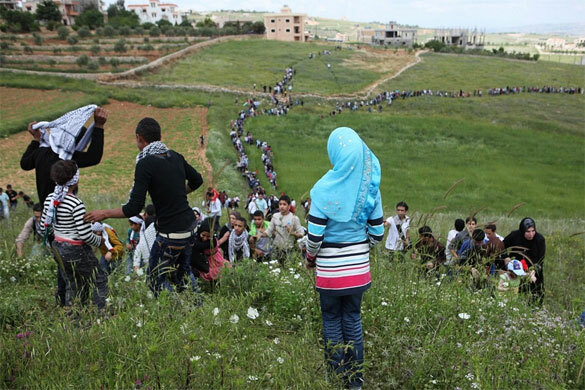 63 years on from the beginning of Al-Nakba, the majority of these villages have long since been destroyed, and a Palestinian refugee population of 750,000 has grown to a worldwide diaspora of nearly 7 million. (6) In a territory that is already one of the most densely populated on the planet, this suggests a ‘return’ instead to a distinctively urban landscape. Over the past few years, a number of initiatives have already begun to grapple with the architectural/spatial dimensions of return. The work of geographer Salman Abu Sitta asserts the fundamental feasibility of a wholesale return of Palestinian refugees,(7) whilst the work of Zochrot has begun to consider the possible stages of return and the challenges of integrating the Palestinian and Israeli socio-political space,(8) whilst DAAR (Decolonizing Architecture Art Residency) have attempted to re-imagine the destroyed Palestinian villages as fragments of a new urban realm, and to consider the reciprocal implications for the refugee camps currently embedded in cities across the Arab world. (9) A collection of architectural projects inspired by this work have already been featured on this site. As a project and a platform, the purpose of arenaofspeculation.org is to narrate the implicit possibilities of the countless acts of ‘spatial resistance’ that are continually being played out in Israel-Palestine, and to assert architecture and planning as tools of empowerment in this struggle for rights and justice. In this spirit, over the coming weeks we will be working to frame an open and collective project for imagining Al-Awda, not only as a means to consider the possibilities for a permanent return of refugees, but also as a vehicle for re-imagining the broader spatio-political contours of Israel-Palestine, and challenging the logic of division and exclusivity of space that has fragmented its physical and human geography and all but severed its connections with the Arab world beyond. 1. See Benny Morris, The Birth of the Palestinian Refugee Problem Revisited, p.577 (cited on Wikipedia). 2. See Mazin Qumsiyeh Popular Resistance in Palestine: A History of Hope and Empowerment, p.98. 6. In 2009, Badil (Resource Center for Palestinian Residency and Refugee Rights) recorded a figure of 6.6 million Palestinian refugees, excluding internally displaced persons, see Survey of Palestinian Refugees and IDPs (2008-2009), p.56. 8. A multi-lingual edition of Sedek: The Journal of the Ongoing Nakba, was published recoently by Zochrot, bringing together a collection of articles on return from their previous publications. Featured on this site. The Palestinian People need to find some railway box cars and place them in the center of town. Each time a victim is killed or wounded by Israeli agression, the victims need to be placed in these box cars. It is images of Jews being herded into box cars during WWII which haunts the Western mind. Calm – Although I appreciate your desire to influence the attitudes of citizens of ‘Western’ countries, in this article we are trying to focus more on the possibilities that Palestinians themselves have to shape their own future. As such, it is not this remote ‘audience’ that matters, but their belief in what they can achieve much more directly through their own actions.